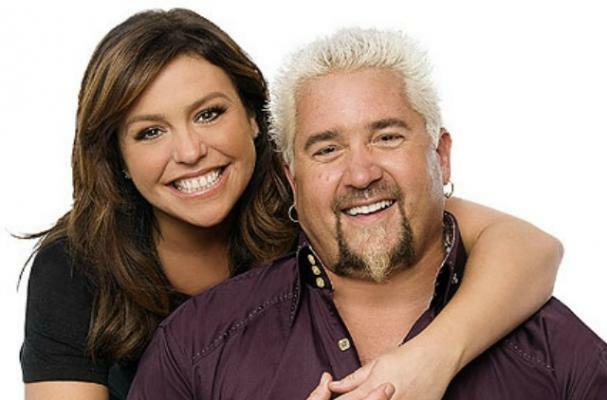 Rachael Ray and Guy Fieri are getting ready to host their brand new mini series, "Rachael vs. Guy: Celebrity Cook-Off." The show, which debuts on New Year's day, will feature the chefs coaching eight celebrities who will compete in weekly competitions. The six-episode series will feature Aaron Carter, Summer Sanders, Lou Diamond Phillips, Cheech Marin, Joey Fatone, Coolio, Taylor Dayne, and Alyssa Campanella. The celebrities will be divided up into two teams who will go head-to-head in weekly competitions. In the first episode, the contestants will have to cook a meal for 150 guests, who will vote for which dishes they enjoyed the most, and which they disliked the most. At the end of the series, the winning celebrity will receive $50,000 for a charity of his or her choice. Love Guy & will watch.. Not to keen on Rachael..
Ewww I hate that picture- why do I feel like Guy smells like really cheap cologne? He grosses me out! Why Rachael? ?